Sam Warburton has praised interim Wales coach Rob Howley for naming his team a week early for Saturday's Six Nations clash against Italy. 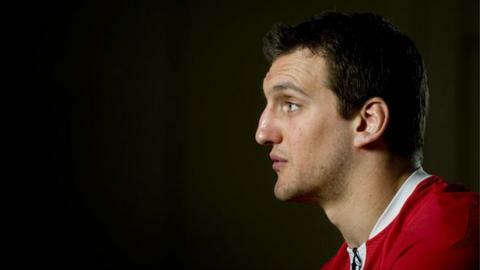 Warburton, captain when Wales reached the 2011 World Cup semi-finals and when they won the 2012 Grand Slam, is expected to be a replacement in Rome. He missed the 16-6 victory over France because of a shoulder injury. "It was quite a smart call and we might as well take advantage of this two-week break in Six Nations games," he said. Although he has lost the captaincy and a starting place, Warburton does not think he has lost form or leadership potential. He said: "I have been looking at my games and things and I don't think there are any obvious mistakes. "If I was slipping off tackles and getting smashed about in the contact area, I would be concerned. "I said to my parents the other day that when things are easy, Wales are doing well and you get a lot of positive press, it's happy days - but you are never going to have a 10 or 12-year career when you are constantly on the way up. "Things and blips do happen, and I knew that would happen before people start questioning your form or whatever, but you have got to completely ignore it." The formal team announcement is on Tuesday, when, barring injury, the only news will be who is on the bench. Warburton said the early team announcement on 12 February had given the squad extra time to prepare. You are never going to have a 10 or 12-year career when you are just constantly on the way up. "We have had eight or 10 sessions, rather than maybe three, perhaps. "It should be one of the best-prepared we have been for a match because we have had that extra time together." Howley named an unchanged starting line-up that included Ryan Jones continuing as skipper just 72 hours after the win in Paris. Ospreys flanker Justin Tipuric replaced Warburton at open-side flanker and he retains his place in the Wales side for the trip to Italy. Warburton, who had been a red-hot favourite to be in the British and Irish Lions tour party to Australia before this tournament, is now relegated to fighting for a place on the bench. The 24-year-old, who has won 35 Wales caps, admits he has banned talk of the Lions tour. "I have got enough on my plate at the moment," said Warburton. "It [Lions selection] is going to be, for any player involved, a special moment. But no-one is mentioning the 'L word'. "The focus in this Six Nations camp is purely on the next match, and if there was any talk on that, players would be the first ones to give someone a slap in the face."